Western countries are experiencing loses of up to €40 billion as the sanctions imposed by them on Russia impede productive cooperation, claims Aleksey Pushkov, Chairman of Russian State Duma Committee on Foreign Affairs. The EU has lost €21 billion from the sanctions, said Pushkov at parliamentary hearings on Monday citing the Spanish foreign minister. According to Japanese economists’ estimates the figure could be as much as €30 billion, he added. "The estimates of a number of European experts show that it’s €40 billion,” he added. “The overall loss of European farmers from the Russian food embargo was €12 billion in 2014." 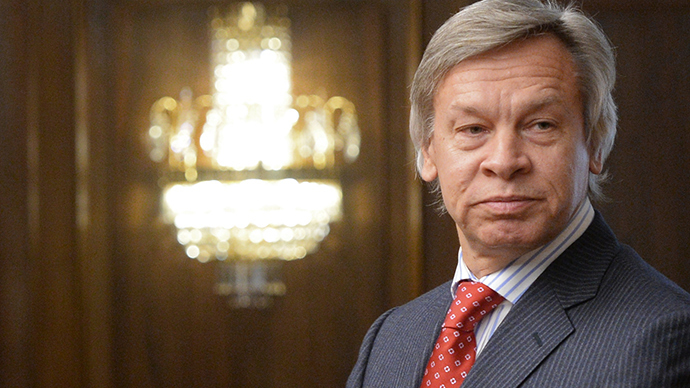 The purchase of industrial products and transport equipment fell drastically, said Pushkov. According to him Germany has suffered the most, losing 8.6 percent in sales, which is around $850 million. He added that serious damage was been caused to the Spanish economy with 40 percent reduction in Russian tourists. READ MORE: Who is hit hardest by Russia's trade ban? However, despite pressure from the West, Russia has managed to maintain positive performance in a number of indicators, he said. "Russia maintained a positive trade balance," Pushkov said, adding that it’s about €8 billion. If the European sanctions are extended, Russia should consider imposing counter measures outside the agricultural sector, he said. "Europe must understand that it will pay the price for the policy carried out by the EU. It seems to me that we should not limit ourselves in that case," said Pushkov. The most dangerous thing in this case is to create the illusion that the sanctions policy is free for the West. "They will impose sanctions on us and we will show good faith - I do not think its right," he said adding that Russia shouldn’t wait for Brussels’ decision but think ahead and warn the West about the consequences its policy may lead to. "Brussels decides for itself, as an independent player. We have to decide how to respond to it, and maybe even inform them what our response will be if the sanctions are extended.” Said Pushkov, however, adding that creating tension is not a way out. "But we cannot endlessly be waiting for what they decide in Brussels. Let Brussels be in suspense waiting for what Moscow will decide," he said. Russian countermeasures to Western sanctions include a food embargo imposed in August 2014. The year-long ban on agricultural products cut imports from the EU, US, Canada and other countries that supported the restrictions against Russia over events in Ukraine.